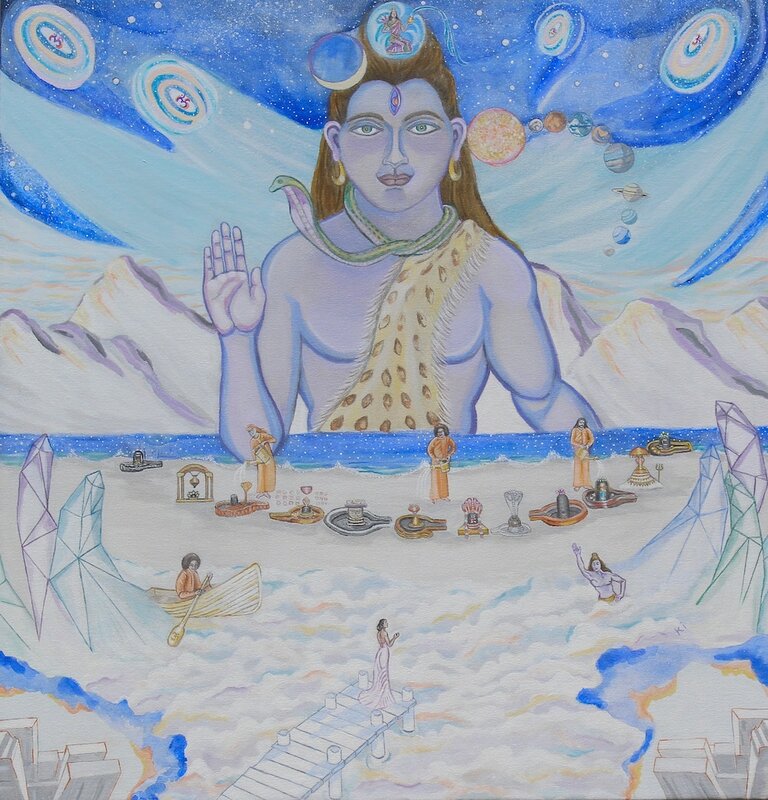 I just had a truly fabulous dream, (12/21/2016): In the dream I discussed a bhajan I planned to sing in conjunction with a painting I did of Sathya Sai Baba as Lord Shiva doing the Tandava dance. I recall being in the lobby of a building waiting for an elevator, the elevator opened and closed suddenly, then left before I could get on. As I waited again, a man came over with his wife, pushing a baby carriage. The elevator finally descended again and opened. The man's wife was busy, so he left her and got onto the elevator with the baby carriage. I entered the elevator and pushed the elevator button number 6, I asked him which button? I think he said 5 which I pressed. Anyway, the elevator went to 6, and we both got off. A startling, stunning scene unfolded before us, we were at the top of the world, everywhere beautiful, shimmering snow crested waves danced in a cosmic ocean. The lobby area was a temple with white planks and wharves extending out into this dynamic sea. This endless sea resembled snowy himalaya mountains but was an incredible ocean. As I gazed literally enchanted by the bewitching beauty of it all, I saw an Indian man swimming in the water, he looked like a young Lord Shiva. He smiled and swam like a dolphin past me. I wanted to swim too but didn't know how deep and cold the waters were and had some trepidation. I strolled onto the planks extending out into this snow sea, and appeared to be floating on top of the luminous waves. Then, I returned to the temple lobby. The man with his baby carriage was there, his child and a group of other children were also standing on the plank. The children wanted to go into the water but I told them to sit and watch the dancing waves. We all played awhile on the wharf. I looked up and saw three Sages observing me from the temple lobby. I walked back towards the temple lobby and sat for meditation. It was so sublime filled with spectacular heavenly scenes and lights. When I came out of meditation I approached the three Sages. They were cradling an idol of a deity and performing a ritual. After the ritual, they each tenderly kissed the idol. I was hoping I could kiss it too. The main priest turned to me and smiled. He then took what looked like a rattle (this resembled the rattle or shell seen in one of Vishwaroopa's hands) and poured vibhuti from it into my hands. At that moment I began waking up. I wondered about this divine encounter. it was so incredibly vibrant and real. As I got out of my bed and walked into the kitchen the thought suddenly struck me that the snow crested ocean could be the Ganges pouring from Lord Shiva's head! All so mysteriously mind blowing! Om Jai Sai Ram!